This is an inverter gate, so named because its output is always the opposite (inverted) state as the input. Note: inverter gates are sometimes referred to as NOT gates, because when the input is high, the output will not be high. 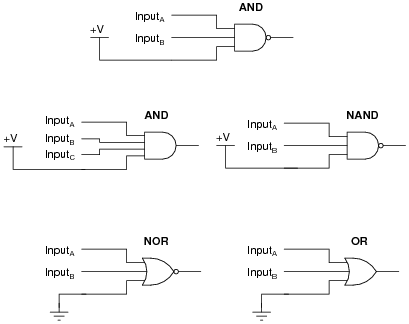 Your students should have no great difficulty identifying this particular logic gate if they have a good digital electronics reference book at their disposal. This is an AND gate, so named because its output goes high only if input A is high and input B is high. Follow-up question: show how a light-emitting diode could be connected to the output of this logic gate to provide visual indication of its output state. Challenge question: show how this logic gate could drive a high-current load such as a solenoid or an electric motor. 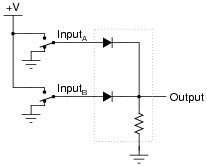 This is an OR gate, so named because its output goes high if either input A is high or input B is high. Follow-up question: replace the two SPDT switches with SPST switches, complete with pullup or pulldown resistors as necessary. Identify what type of logic function is represented by this gate circuit (AND, OR, inverter, etc.). 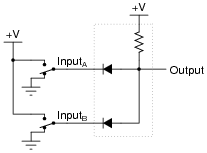 This is an OR gate circuit. Diode-resistor gate circuits such as this are rarely used in real digital circuitry because they have no capacity to amplify weak input signals. They also have no capacity for signal inversion, rendering them incapable of representing a great many logic function types. Gates made from transistors are much preferred over diode-resistor technology. Identify what type of logic function is represented by this gate circuit (AND, OR, inverter, etc.). 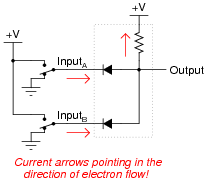 Also, trace the directions of all currents in this circuit. This is an AND gate circuit. Follow-up question: show how the two SPDT switches could be replaced by SPST switches (without the need for pullup or pulldown resistors). Challenge question: explain why it may be impractical to design this diode-resistor gate circuit to directly drive an LED so that it lights up when the output state is "high." Any high input guarantees a high output. Any high input guarantees a low output. Any low input guarantees a high output. Any low input guarantees a low output. Any high input guarantees a low output: NOR gate. Any low input guarantees a high output: NAND gate. Any low input guarantees a low output: AND gate. This is a very useful way to think of the different logic gate types, as often you are faced with a choice of which gate type to use for a specific function in a digital circuit based on a requirement cast in these terms (Äny blank input guarantees a blank output"). Considered in terms of what input state forces a low output, the choice to use an AND gate becomes obvious. Any difference in the inputs guarantees a high output. Any difference in the inputs guarantees a low output. Also, explain how this sort of gate identification could be useful in troubleshooting logic gate circuits. Any high input guarantees a high output: OR gate. 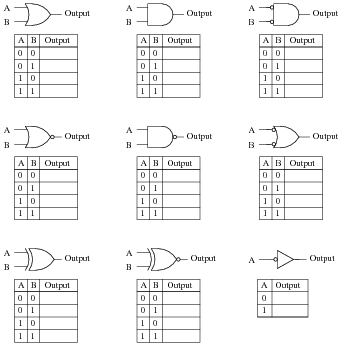 Any difference in the inputs guarantees a high output: XOR gate. Any difference in the inputs guarantees a low output: XNOR gate. Also, explain how an understanding of this can be helpful in troubleshooting faulted logic gates. B = A when Control is high: AND gate and XNOR gate. B = A when Control is low: OR gate and XOR gate. 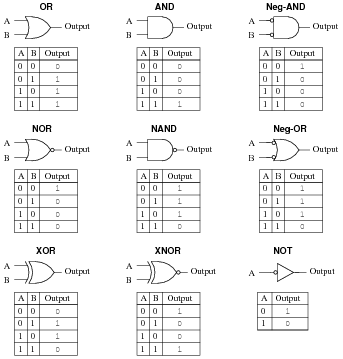 B = [`A] when Control is high: NAND gate and XOR gate. B = [`A] when Control is low: NOR gate and XNOR gate. Follow-up question: explain why XOR and XNOR gates are so useful as signal controllers. This is a very useful way to think of the different logic gate types, as it is often required to use a gate as a controlled buffer or controlled inverter. It would be far too easy for you to look here for the answers! Research the website of a digital IC manufacturer, or consult a reference book, to find the part numbers and datasheets you're looking for. Be prepared to show at least one datasheet for class discussion. If you haven't already, ask your students to provide a sample truth table for any of these gates. 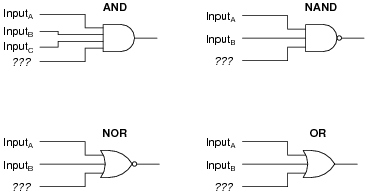 Follow-up question: how do you suppose the truth tables would look like for three-input OR, NOR, and NAND gates? Explain how one may transition from the regular two-input gates to gate circuits with more than two inputs. What remains the same despite additional input lines? There isn't much to comment on here, but this is a concept some students do not immediately see (how gates work with more than two inputs). Suppose you needed a two-input AND gate, but happened to have an unused 3-input AND gate in one of the integrated circuits ("chips") already in the system you were building. Of course, you could just add another IC containing 2-input AND gates, but it seems a shame to waste the 3-input gate already there. In each case, describe why your solution works. A helpful way for students to think about this question is to consider gates in terms of what input state forces the output to go to a particular state. For example, AND gate outputs are forced low by any low input, therefore the unused input had better not be tied to ground - the only remaining option is to tie it high.